By using Smart2Pay SDK for mobile, you can quickly integrate more payment options directly in your mobile application. Our SDK provides one unique interface to Cards, Alipay and WeChat in-app payments. For Alipay and Wechat, the payments are initiated by the user from the mobile app and the initial message is sent by your server to our REST API in the usual way (see Create a payment), plus sending an additional parameter IsMobileApp: true. We will respond back with the Instructions field that needs to be passed from your app to our SDK. Our SDK handles the various calls to Alipay or WeChat apps and returns the control to your app for the final verification of the status. Besides Alipay and WeChat, our Mobile SDK can be used for in-app purchases using Credit Cards. The advantage of using our SDK is that the credit card details never reach your server, simplifying to a minimum the PCI requirements you must meet. 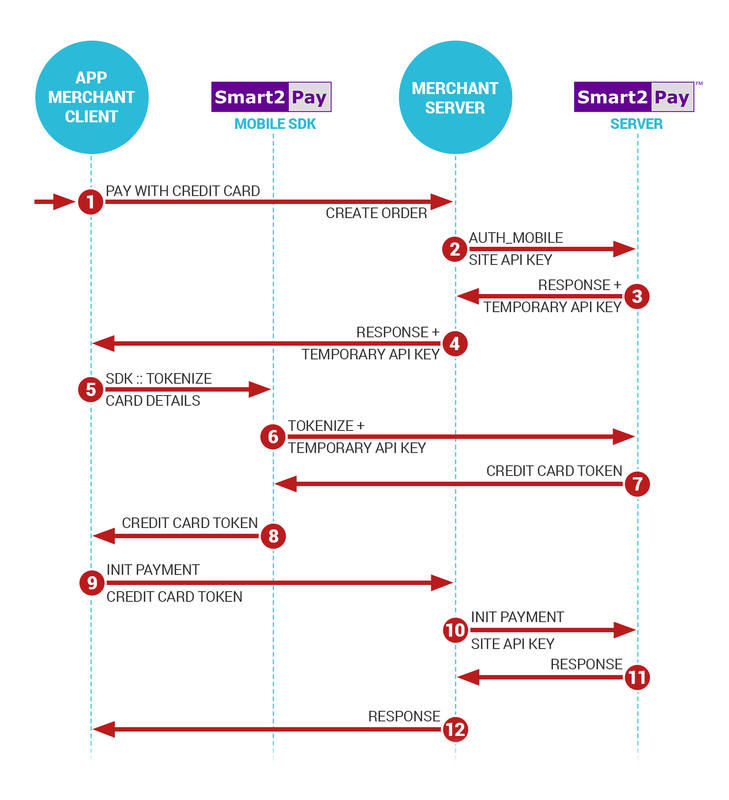 You need to follow the below steps to build an in-app payment flow using Smart2Pay.SDK.Payment, a class designed to make building your app’s checkout flow as easy as possible. 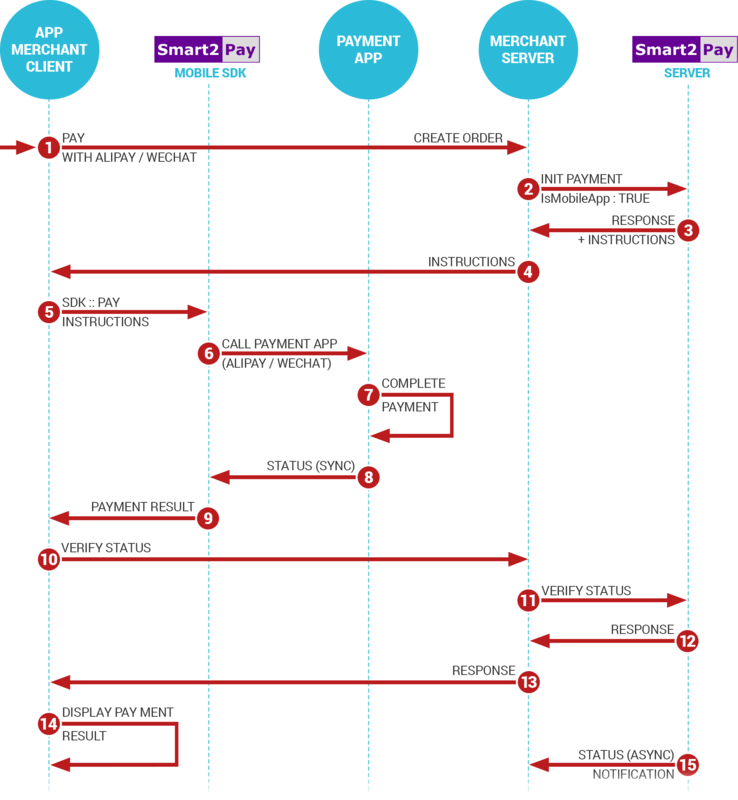 Download the smart2pay.aar file located at: https://github.com/Smart2Pay/SDK-Android-Release/tree/master/releases. Place the .aar file in the app/libs folder. Add this to your app Gradle file and click on the Sync Now button. Smart2Pay Android SDK Instructions for Credit Cards (Java). Now that you have imported the Smart2Pay.SDK package into your app, you need to follow the below steps in order to set up the Mobile SDK for Android in Java language. If you are using Kotlin go to our section: Smart2Pay Mobile SDK Configuration using Kotlin language. [SERVER] Once the order is created on your server, from the server create a Payment using our REST API and specifying isMobileApp: true. [SERVER] Our server responds with Instructions field which you need to pass to the app. "Instructions": "_input_charset=\"utf-8\"&appenv=\"system=android^version=3.0.1.2\"&body=\"Alipay Payment\"&currency=\"USD\"&forex_biz=\"FP\"&notify_url=\"https://europaytest.smart2pay.com/Alipay/Landing/AlipayNotificationURL.aspx\"&out_trade_no=\"s2ptest200336\"&partner=\"2088201612260077\"&payment_type=\"1\"&rmb_fee=\"1\"&secondary_merchant_id=\"GP1045\"&secondary_merchant_industry=\"5946\"&secondary_merchant_name=\"demo iasi test\"&seller_id=\"2088201612260077\"&service=\"mobile.securitypay.pay\"&subject=\"Alipay Payment\"&supplier=\"demo iasi test\"&sign=\"vRQ1ouMvn0rJUCxSEi91RLJcS0NU7mojYfJpfT8gxtctF8jfJ4x6uN8t0ETdDdmGziqP7IsYHTSAHdFLHGO4hQdovyzJMna42nc9DcfMMlhTX7ZVCa7rUuieBWcW0ek8w3DxojrWnWT9lM3lUQZVLsY1CjXFGJ126x4TnjrA86w%3d\"&sign_type=\"RSA\""
[APP] Get the instructions from the server response. [APP] Call Smart2Pay Mobile SDK by creating a Payment object, passing the Activity, payment type and instructions. Then trigger the payment using a PaymentManager object. [APP] Our SDK calls one of the two callbacks onPaymentSuccess or onPaymentFailure, depending on the payment result. [APP] Display the payment result to the user. [SERVER] As a backup for any client communication issues, Smart2Pay will also send to your server a backend notification as documented here: Payment Notification. SDK is now fully functional in your app! Now that you have imported the Smart2Pay.SDK package into your app, you need to follow the below steps in order to set up the Mobile SDK for Android in Kotlin language. If you are using Java go to our section: Smart2Pay Mobile SDK Configuration using Java language. First of all you need to start using and install the Kotlin plugin for Android development. For more information, please visit: Getting started with Android and Kotlin. Click Tools | Kotlin | Configure Kotlin in Project. Check if all modules and the selected Kotlin version are correct. Press OK and Kotlin is now part of your Java project. [APP] Pass the instructions from the response to the payment object together with the payment type and Activity. [APP] Call Smart2Pay Mobile SDK by calling pay() function from the paymentManager object. var instructions: String = ""
The temporary API Key must be passed to the app. From the app you collect the credit cards details from which you build a CardAuthenticationRequest object, together with the temporary API key obtained in the previous step. Set callback functions to handle Success and Failure cases. Our SDK calls our server with these details. The server responds with a token to our SDK. Our SDK passed the token back to your APP via the callback function setup in step 5. A credit card transaction using token is now initiated from your server. For more details go to: Recurring Card Payments section. You can store the token on your server for subsequent purchases. Our server responds to your server with the Authorization result. Upon a successful result you can release the goods or services. You pass the payment result to the app. You need to follow the below steps to build an in-app payment flow fully functional using Smart2Pay SDK in your iOS app using Swift. Import the framework into your project by either dragging it into the project or go to File | Add files to “project name”. Add the framework to the Embedded Binaries. Select the Project icon in your file hierarchy – make sure you are in the General tab – Embedded Binaries. If you don’t see it in “Embedded Binaries” and don’t see it in the “Linked Frameworks and Libraries”, just click the + on “Embedded Binaries” and select the Smart2Pay.framework. If you see it in “Linked Frameworks and Libraries” but not in “Embedded Binaries”, you should first remove it from “Linked Frameworks and Libraries” and click the + on “Embedded Binaries” and select the Smart2Pay.framework. This will automatically add it to both. If you see it in both “Embedded Binaries” and “Linked Frameworks and Libraries”, you don’t need to do anything. Now that the SDK is in the app we can actually use it in the code. Continue with setting up the SDK: Smart2Pay iOS SDK Instructions (Swift). Now that you have imported the Smart2Pay.SDK package into your app, you need to follow the below steps in order to set up the Mobile SDK for iOS in Swift language. To get back to the app after doing a payment we need to set an URL Scheme. Select the Project icon again in your file hierarchy – make sure you are in the Info tab – URL Types. Fold it open and click the + button. You only need to set URL Schemes field. For example, you can use your bundle identifier. This ensures that there’s no other app that uses this URL Scheme. We’re all set to make a payment now! Create a payment from the data you’ve attained from the API. var currency: String = ""